Our community has 3,117 members, 117 online now. We’ve published 9,772 stories, shared 8,322 images, made 10,347 blog posts and written 121,506 forum posts. The dugout canoes were overloaded as they were paddled up the Niger River by the two guides. The freeboard of the canoes was minimal. They weren’t meant to hold three Americans. I was the heaviest and rode with one guide while two of my daughters rode with the other. I was preoccupied with the thought that I was nuts and we were in over our heads. We were being taken to a place where we could watch hippopotami in the wild. Don’t ask me where. I have no clue. We met our guide at the Grand Hotel du Niger in Niamey, took a drive to a place where hundreds of people were washing in the Niger River, got into two dugout canoes, and then began making our way upstream along the edge of the widest river I’d ever seen. The river was silty, the October weather was hot, this was an adventure, and it was the most foolish thing I’ve ever done. Our youngest daughter, A--, chose to join the Peace Corps after college. It was a two-year assignment in Niger; the poorest country in the world. She had been there more than a year and we’d been sending parental care packages at a cost of one hundred to two hundred dollars every few weeks to keep her fed. The phone calls, once every six weeks or so, were two and three times as expensive as a package. There was no guarantee that we would connect unless we used AT&T. The pre-paid internet phone cards that routed our call through Italy and through an underwater telephone cable across the Mediterranean Sea to the African continent were cheaper. This is when I learned you get what you pay for. If you know what the quality of a phone call was in 1960 when the undersea cable was laid, then you know what we were dealing with in 2004. Same cable, same quality. I sang the praises of AT&T and satellite communication many times that year. I cried the blues about the cost; however, the peace of mind it brought the lovely Mrs. L was priceless. This was our baby daughter after all. After hearing about the cricket infestation of biblical proportions in which our baby, A--, cowered in her hut with blankets over her head for twenty-four hours, it was decided I should go and check on her. The stories of mud huts, outside sanitation, animal defecation in the village well, how the village had been freed from slavery in the late 1990s, and how our baby daughter was the first Peace Corps worker to be assigned to the village, none of these had brought us to the point of parental intervention. But now our daughter’s fear of the inches-deep layer of dead crickets in and around her hut was enough. The American suburbs had not prepared A--for this level of primitive living. Time for Dad to see for himself what was going on. Our oldest daughter, C--, wanted to come, too, and I welcomed her company. The plan was a week in Niger and a stop in Paris on the way home. It was a good plan. The plan to see wild hippopotami wasn’t so good. I should have noticed the lack of life jackets but I didn’t. All I can say is that we learn as we go. We didn’t have a need for them but the whole idea of life jackets is to have them when you need them. A life lesson for Dad. As we left all signs of habitat behind us and the guides were in their second hour of paddling, they began to talk about piranha in the river. They were talking up the fact there was some danger from the leaks in the canoes and that piranha had eaten more than one tourist over the years. I smiled. I knew they were teasing us. There are no piranha in the Niger River and none that were native on the African continent. When I told them there were no piranhas in Africa, the guides laughed at the joke they were having; my daughters were relieved. They asked about crocodiles and I told them the river was moving too swiftly for crocodile. I didn’t know at the time there were crocodiles in the Niger River but I was sure that the current was too fast for them. I might have been wrong about that but we didn’t see any crocodile during the trip. The leaks in the dugouts bothered me. Especially in my canoe. The guide paused his paddling every so often to stuff bits of cloth into the cracks through which water was flowing freely into the canoe. Sometimes I had to bale. Once I was past the terror of traveling with two native guides, in leaking dugout canoes, on the third largest river in Africa, without life jackets, in the wild with nothing but water, sandwiches, and cameras, the views were impressive. The power of this river is memorable. The wilds of the riverbank were fascinating. I’d like to describe it all in detail but my memory is faulty. My feelings aren’t. I was impressed and awed by what I experienced. We pulled onto an island when we saw the first of a family of hippos. We were well aware of their violent nature and we kept a safe distance. The island had hippo crap everywhere. This was their territory. It was a family unit and the calves were often on the backs of their parents. We guessed they might approach the island if they needed a rest. If so, we were ready to leave at a moment’s notice. 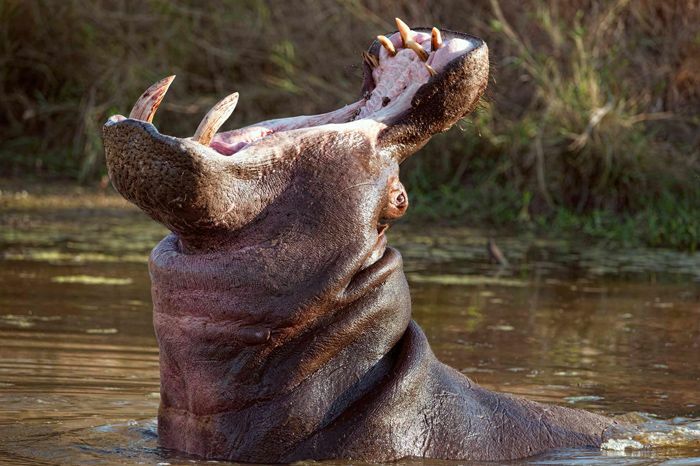 The picture above is all you really need to know about hippos. TMT: Teeth, Mass, and Temper. We stayed about an hour, maybe a little more while we ate our sandwiches, and then headed downstream to civilization. Civilization has a completely different meaning in Niger, Africa, then it does in Oregon or New Mexico, USA. I hope you never learn the difference. Do something good today and don't take what is not yours. You can email me at Trystin715@hotmail.com for permission.